The Riversiders travel to Prestwich Heys on Saturday before hosting leaders Longridge Town on Monday. They go into those games on the back of three consecutive victories over AFC Darwen, Avro and St Helens Town. “There have been some good performances,” Baker said. “Saturday (St Helens Town) probably wasn’t our best but, sometimes, you have to grind them out. 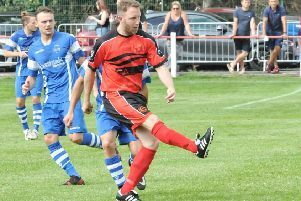 The win against Avro seven days ago was Garstang’s first game for a fortnight since beating AFC Darwen on March 27. Baker’s players returned with victory against an Avro side looking to keep the pressure on Longridge at the top. Baker said: “I’ve been in teams where I’ve had a bit of time off and it feels longer than it actually was. “Then we’ve come back and haven’t been able to string two passes together – but we jumped straight back into it against Avro. Baker’s squad now has a tough double-header coming up with a trip to fifth-placed Prestwich Heys. That’s followed by a home game against Longridge, who are battling for the title but have struggled to beat Garstang in recent seasons. Baker said: “Prestwich are a very good side and it’ll certainly be a difficult place to go. “Longridge can look at the game in two ways; they can be nervous because we’ve beaten them the last five times or they think it can be the greatest day in their history if results go their way.